Retirement accounts typically invest in more than a single stock. 2. Can You Invest a 401(k) in Day Trading? One of the most useful tools for saving for retirement is an employer-sponsored 401(k) plan, which is often a perk for full-time employees. Typically, employers will allow workers to contribute to the plan from each paycheck, and a large number of employers will also match employee contributions up to a certain point. The funds in your 401(k) are often invested in a combination of assets, including stock. The assets selected for your 401(k) are often left to the discretion of the fund manager being employed by your business. Since your company's fund manager usually gets control over choosing the assets in your 401(k), it is not common for you to get to choose individual stocks. By far, one of the most appealing elements of a 401(k) is the employer investment match. Many employers will specific a specific percentage to which they will match your personal contribution to your 401(k) with funds of their own. As you can expect, this will allow your retirement savings to grow more rapidly than if you were the only one putting money into it. There is one potential disadvantage to this system, however. In exchange for granting a third-party the permission they need to effectively manage your retirement, you will voluntarily give up a degree of control over your investments. However, the reality of the situation is that most 401(k) plans are managed by a third party to ensure that they provide adequate retirement income when an employee is ready to retire. Most 401(k) plans rely on diversification to balance risk and ensure retirement income that meets employee expectations. This is why 401(k) plan managers invest in bonds, individual stock and mutual funds, among other investment types. Employees might be allowed to select how they want their 401(k) funds invested, but often this choice is between long-term, aggressive investment strategies and more short-term, conservative options. Only in a handful of cases can employees choose individual stocks or investments for their 401(k)s.
In some cases, employers choose 401(k) plans for their employees that offer the option of choosing individual stocks. However, this may only apply to a set percentage of the funds in the plan. The plan may still require employees to diversify or invest in more than one stock, thus limiting how much they can put into a single company's stock. If your employer offers a 401(k) with this high degree of employee control, you will take on added responsibility for your retirement income if you choose to exercise it. Even if you don't have a 401(k) that allows you to invest in individual stocks of your choosing, you can still put money into a company as a means of saving for retirement. IRAs, or individual retirement accounts, are personal retirement plans that offer more control, including the choice of stocks. 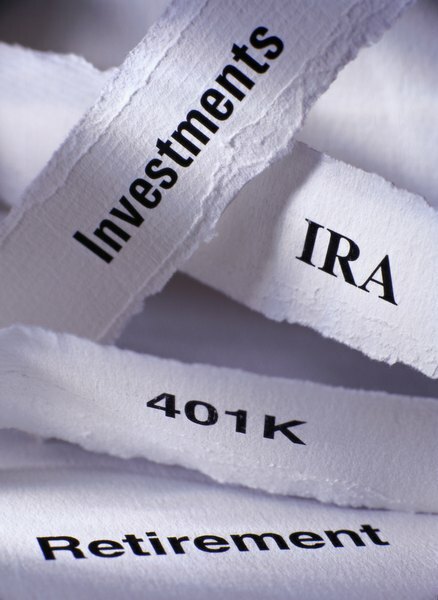 You can fund an IRA with pre-tax income, up to a set annual limit that depends on your age. You can also buy shares of stock that you earmark for retirement, eliminating the tax benefits of a retirement plan but also working around the limitations of IRAs and 401(k)s.
Whichever method of financial investing you believe is best for your circumstances, it is critical to develop a risk-fee, stable method of investing which will protect your funds from the volatility of the marketplace at large. Can You Be Refused to Withdraw From Your 401(k)?